Special Guest: This week we welcome Stephen Fowler, who is the Creative Director at InfoAge, the organization behind refurbishing the TIROS 1 dish and the Science History Learning Center and Museum at Camp Evans, Wall, NJ. Simulation of Pluto’s moon Nix sped up so that one orbit takes 2 seconds instead of 25 days. Wobbling and tumbling end-over-end like a badly thrown football, Pluto’s moons are in a state of orbital chaos, say scientists. Analysis of data from NASA’s Hubble Space Telescope shows that two of Pluto’s moons, Nix and Hydra, wobble unpredictably. If you lived on either, you’d never know when and in what direction the Sun would rise. One day it would pop up over your north horizon, the next over the western. Every sunset would be like a proverbial snowflake — not a single one the same. Watch the video, and you’ll see what I mean. Not only does the moon totter, but the poles flip. If there was ever a solar system body to meet the criteria of end-of-the-world, doomsday crowd, Nix is it. The moons wobble because they’re embedded in the bizarro gravity field of the Pluto-Charon duo. Charon is officially the dwarf planet’s largest moon, but the two bodies act more like a double planet because Charon’s so huge. OK, it’s only 750 miles (1,212 km) in diameter, but that’s half as big as Pluto. Imagine if our moon was twice as big as it is now, and you get the picture. As the duo dances an orbital duet about their common center of gravity, their variable gravitational field sends the smaller moons tumbling erratically. The effect is enhanced even more by their irregular and elongated shapes. It’s likely Pluto’s other two moons, Kerberos and Styx, are in a similar situation. Because their moment to moment motions are essentially unpredictable, scientists describe their behavior is chaotic. Saturn’s moon, Hyperion, also tumbles chaotically. The discovery was made by Mark Showalter of the SETI Institute and Doug Hamilton of the University of Maryland using the Hubble Space Telescope and published in today’s issue of the journal Nature. Showalter also found three of Pluto’s moons are presently locked together in resonance, meaning there’s a precise ratio for their orbital periods. “If you were sitting on Nix, you would see that Styx orbits Pluto twice for every three orbits made by Hydra,” said Hamilton. That’s not all. If you’ve ever grilled with charcoal, you’d have a good idea what Kerberos looks like. Dark as one those briquettes. The other moons are as bright as sand because they’re mostly made of ice. Astronomers had thought that material blasted off the moons by meteorite impacts should make them all the same basic tone, so what’s up with Kerberos? No one knows. 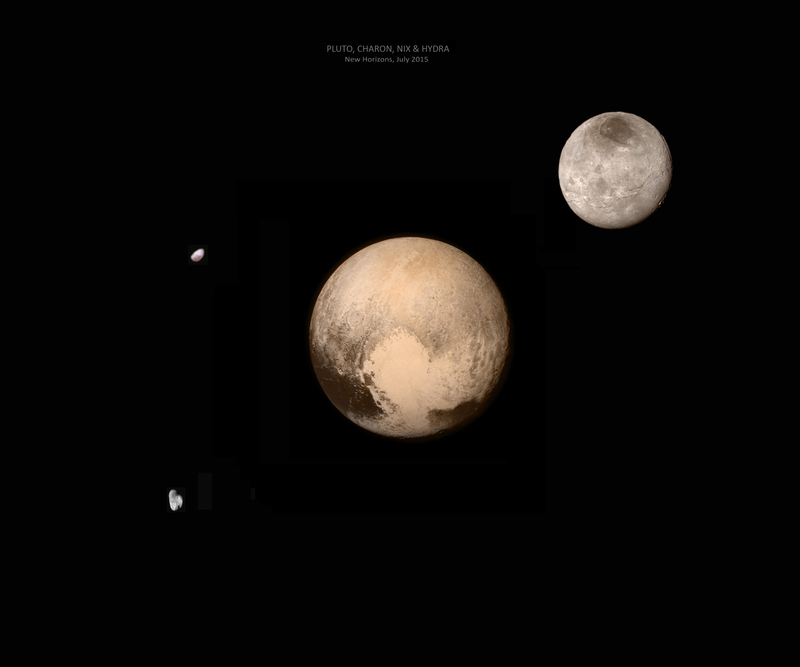 This illustration shows the scale and comparative brightness of Pluto’s small satellites. The surface craters are for illustration only and are not real. Pluto’s moons are thought to have formed during a collision long ago between the dwarf planet and a similar-sized object. 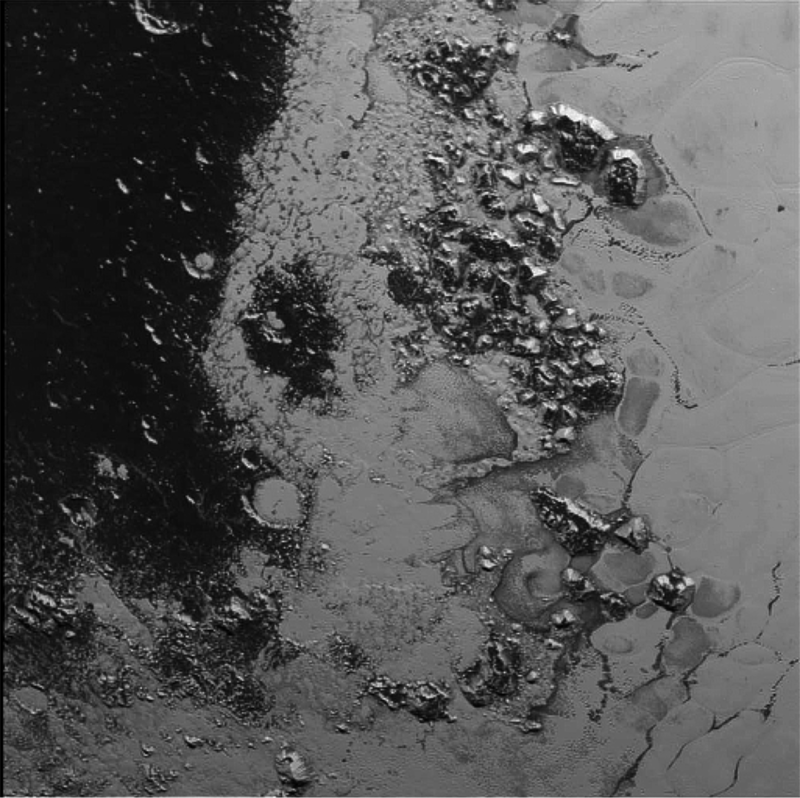 The smash-up created lots of smaller bodies that eventually took up orbits about the present-day Pluto. 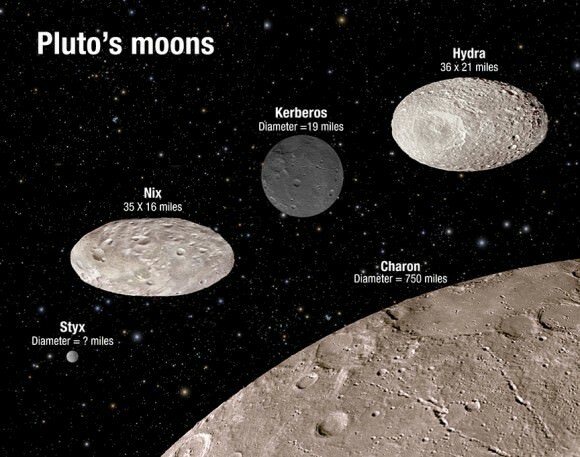 Outside of Charon, the biggest leftover, the other moons measure in the tens of miles across. The four little ones — Nix, Styx, Kerberos and Hydra — were discovered with the Hubble scope during surveys to better map the Pluto system before New Horizons arrives next month. No one would be surprised if even more itty-bitty moons are found as we draw ever closer to the dwarf planet.